Number Two Son was just commissioned to paint a portrait of Condoleezza Rice. Everyone in our family was excited. We were looking forward to seeing Number Two Son present the portrait. It was going to happen at a press conference. Only press were allowed to attend. Suddenly it hit me. I write a blog–I’m a member of the press! I requested credentials and prepared for the press conference. Mrs. LanceAround, Number One Son and Number One Daughter all plan to go as my correspondents and photographers. Even Grammy LanceAround flies down from Pennsylvania to attend. This is going to be great. Then we get a call just hours before the press conference–there is only one pass for the press conference. It was then I remembered the story of Beron from The Hobbit. He was a skin changer who could turn into a bear. He lived alone and did not like company. The Hobbit and Gandalf went alone to Beron’s doorstep and they arranged to have the dwarves come to the door, in pairs, five minutes apart. Gandalf introduced the Hobbit and then told Beron the story of their adventure. Five minutes later, the first two dwarves showed up. By this time, Beron was so engrossed in the story, he grunted at the dwarves and asked Gandalf to continue. The story continued but was interrupted every five minutes by the addition of two more dwarves. By the end of the story, Beron had 14 strangers on his doorstep. Now it was too late to turn them away. I was told only one press person would be allowed in the press room, so I showed up with my photographer, Number One Son. “Is it okay if he takes photos for my story?” This was allowed. We both entered. Five minutes later, Mrs. LanceAround shows up with Number One Daughter. “We’re here because our son is going to present a portrait to Condoleezza, we’ll just wait outside.” They are ushered in. Five minutes after that, Colin appears with Grammy LanceAround carrying his portrait. “I came with my Grammy to present the portrait.” Both are admitted. Thanks to J.R.R. 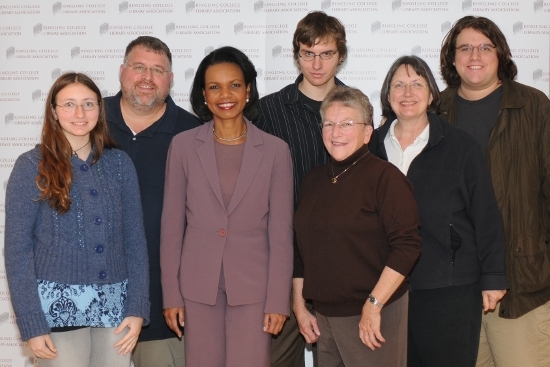 Tolkien, author of The Hobbit, we now have a photo of the entire LanceAround family with Condoleezza Rice as Number Two Son presents his portrait. 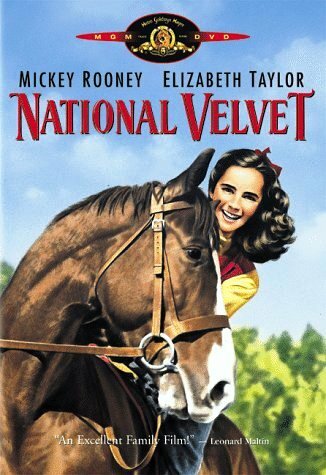 “National Velvet” is one of my all time favorite movies. It tells the story of an English adolescent girl, Velvet, who manages to acquire a horse, train him and enters him in the Grand National Steeplechase. [Caution: Movie spoiler alert!] When she can’t find a suitable rider, she pretends to be a man and rides the horse to an apparent victory. The win is disqualified when it is discovered that she is a girl. Despite this, she has become a national hero. An often overlooked subplot of the movie revolves around Velvet’s mother. She is a wise yet taciturn woman who had once gained international fame for swimming the English Channel. It was clear that Velvet was trying to live up to her mother–and succeeded! Flash back to when I was 19 and I managed to win a national championship in wrestling. This remarkable feat was all the more surprising as I had never won a varsity wrestling match in high school. Like Velvet, I had somehow bloomed from a nobody to a national figure. This accomplishment became a defining moment for my life. It had a profound impact on the man I was to become. It gave me confidence and it gave me credibility in ways I could not have imagined. Now that I’m a father, I see the story from a different perspective. When I was younger, I identified with Velvet. I had a dream, a desire and a laser-like focus on accomplishing it. Now, I identify with the mother. I am older, hopefully wiser, and I watch my children as they struggle to find the dreams in their lives. My youngest son has always had a passion for art. I enjoy watching him focus on his art and hone his skill. 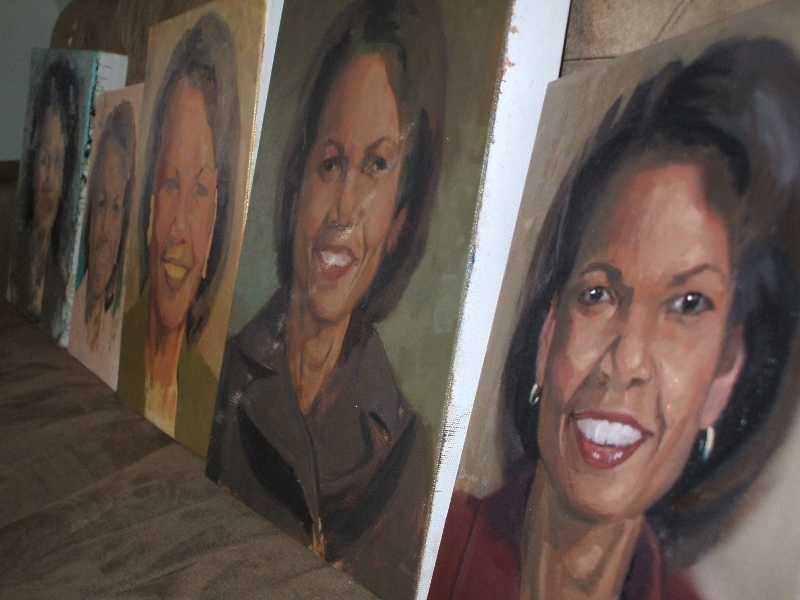 Last week, he fulfilled a commission to paint a portrait of Condoleezza Rice, the former Secretary of State. He presented his portrait to her at a press conference in Sarasota, FL. But it wasn’t until I saw my son handing the portrait to Condoleezza Rice that the parallel to the National Velvet story suddenly hit me. I was the older, hopefully wiser, parent who had his moment of national fame many years ago at the age of 19. 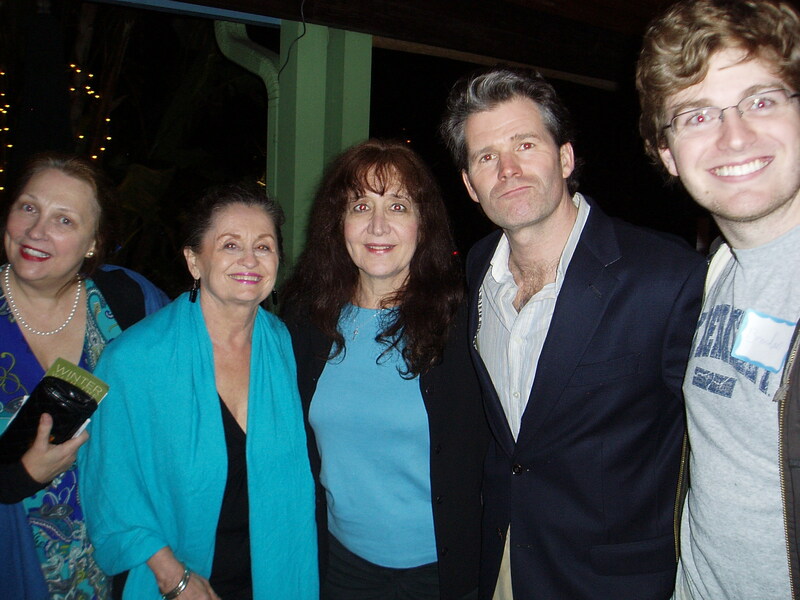 Now Number Two Son was the young 19 year old seeking his way in the world. 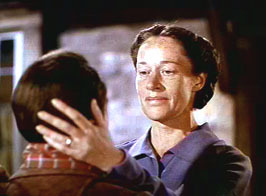 In the movie, mother was a swimmer, daughter was a horse rider. In our story, I was a wrestler, Number Two Son was an artist. I only won a sports championship. Number Two Son received a commission to paint one of the most powerful women in the world. It cost over $20,000 a year to send Number Two Son to one of the most prestigious art schools in the nation. Sometimes I wonder if it is worth the cost. Please understand that LanceAround does not have a critical eye for art. How can I possibly tell if the education Number Two Son is getting at Ringling College of Art and Design is worthwhile? The answer came one day as we were driving around the campus at Ringling. There, in the middle of the sidewalk, was a structure about three feet tall and two feet in diameter. It was made of wire and other metals. The wire was roughly in the shape of cylindrical container. The metal inside were various pieces of geometric and organic shapes. Frankly, to my untrained eye, it looked like a bunch of junk in a trashcan. 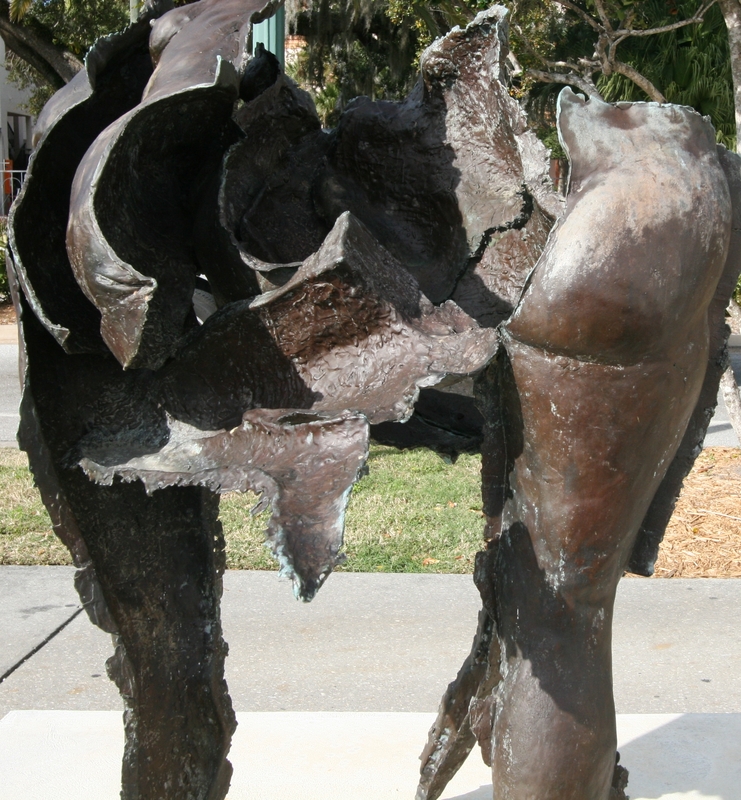 The fact that it was in the middle of the sidewalk–presented in the same way as various sculptures throughout the campus (just like the piece pictured above)–made me think that it had been created as a piece of art. I just wasn’t sure. I wish I had taken a photo of it. Yeah, that’s when I became convinced that paying for his education was money well spent! What does it take to paint a portrait? I’m not an artist, so I don’t know the answer to that Question. When I watch artists work, it appears effortless. Somehow they take brush to canvas and with a few flicks of their wrist they are able to produce shapes, shadows and structures that resemble something wonderful. It is amazing! I never understood just how difficult it is. 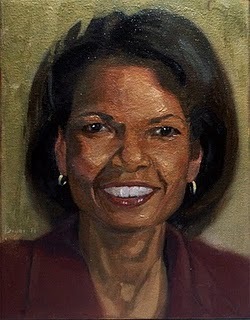 Just before Christmas, Number Two Son was commissioned to paint a portrait of Condoleezza Rice. I went with him to the art store. He spent over an hour picking out the right paint, the right canvas, the right brushes and some other needed supplies. Then he began to paint. He worked for hours, then days. The portrait looked fantastic. He didn’t like it. So he threw it away. Again he worked…hours…days…weeks. Again, he didn’t like it. Again, he threw it away. By the time Christmas break was over, he had painted four different portraits. When he was back at school I would call him every few days to ask how things were going. Each time I called there was something about the portrait that just wasn’t right. He talked with his art teachers. One of them recommended that he switch from oil to watercolor. He started over again. Then he switched back to oil. The next morning we drive to Colin’s home. He had stayed up all night. The portrait was still wet. He still wasn’t satisfied with it. 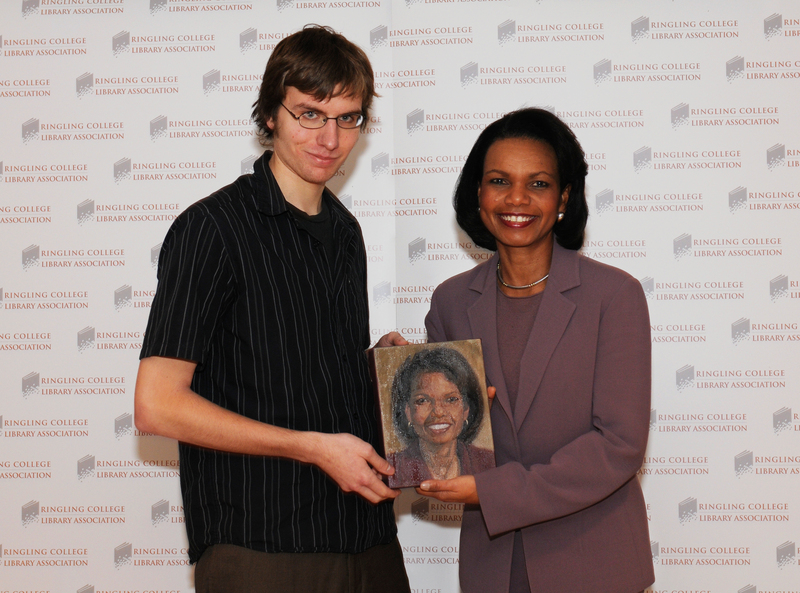 "Be Careful, It's Still Wet"
When he presented the portrait to Condoleezza Rice, she had to be careful to allow the bottom of it to rest on her hand lest she get wet paint on herself. The portrait was fantastic. It looked just like her. She was all smiles. So was Colin but, deep down, he wanted to make it even better. In the end, this was his seventh attempt to paint the portrait. Some of them are displayed in the photo above. Colin still wishes he could do another one. Maybe this drive for perfection is the reason this 19 year old kid was commissioned to paint a portrait of the former Secretary of State–Something very few professional painters ever get to do. The only thing I know for sure is this won’t be his last commission! 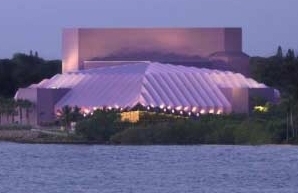 The Van Wezel Performing Arts Center is a purple, Frank Lloyd Wright Foundation building located right on the bay in downtown Sarasota. This is the venue where Condoleezza Rice was invited to give a lecture. It was sponsored by the Ringling College Library Association–an organization that raises money for the library at one of the most prestigious art & design institutes in the country. As a member of the press and the father of the Ringling student that was commissioned to paint her portrait, I had the pleasure of attending her press conference and lecture. 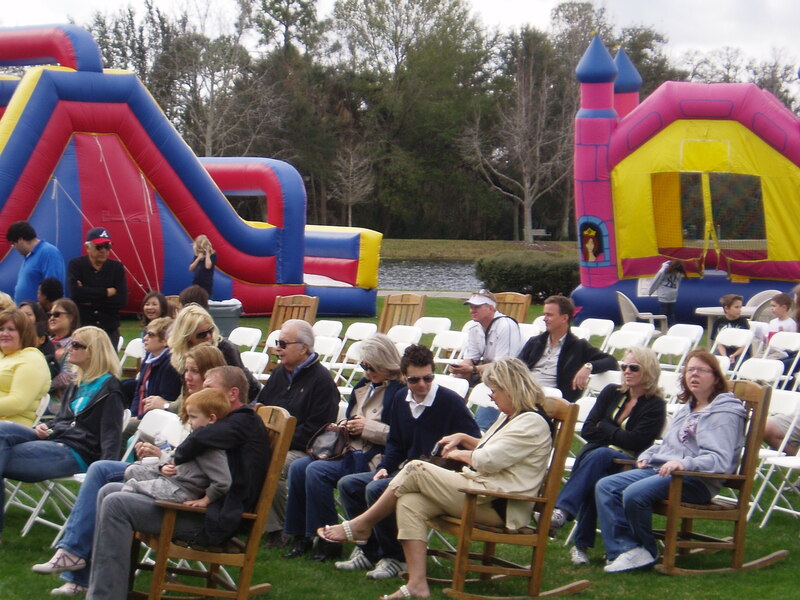 Today’s blog focuses on the community of Sarasota. Sarasota is a bedroom community located about two hours from Disney World. It is a fascinating cosmopolitan community of extreme diversity. It is the winter home of the Ringling Bros. and Barnum & Bailey Circus, features higher education at Ringling College of Art & Design, New College, Eckerd College, FSU Film School, Keiser College, Sarasota County Technical Institute, State College of Florida, University of South Florida at Sarasota-Manatee and Argosy University/Sarasota. It has a huge and devoted artistic following, many cultural, educational and architectural highlights and, of course, some of the most pristine beaches in the continental US. A drive downtown reveals a plethora of fancy shops, restaurants, marinas and artistic venues. A tourist destination, Sarasota has been buffeted by the economic forces–doing exceedingly well during boon times and exceedingly poorly during busts. Now is a great time to get a bargain on a Sarasota condominium! 17% of the population is below the poverty line while in 2006 Sarasota had the distinction of being recognized as the “the country’s meanest city” by the national coalition for the homeless. Yet it is an idyllic location for a vacation. 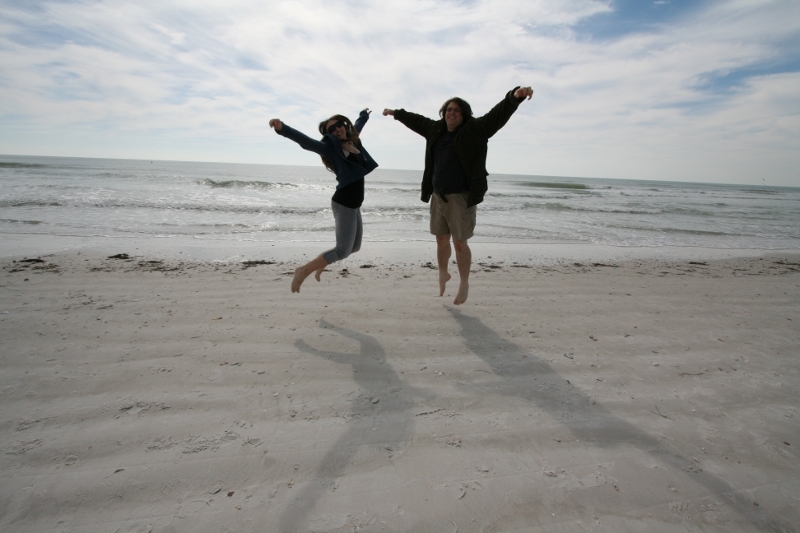 The biggest attraction of Sarasota is the pristine white beaches of Lido Key and Longboat Key. With plenty of vacation rentals and hotels and just down the road from St. Armand’s Circle, renown for its fine restaurants and shops, this is a perfect area for a relaxing getaway. The Sarasotoa Convention and Visitors Bureau is a good starting place to plan your trip to Sarasota. While you’re there, pop into Ringling College and say hi to Number Two Son! At age 19, Colin Boyer has achieved professional acclaim that is rare for an artist twice his age. 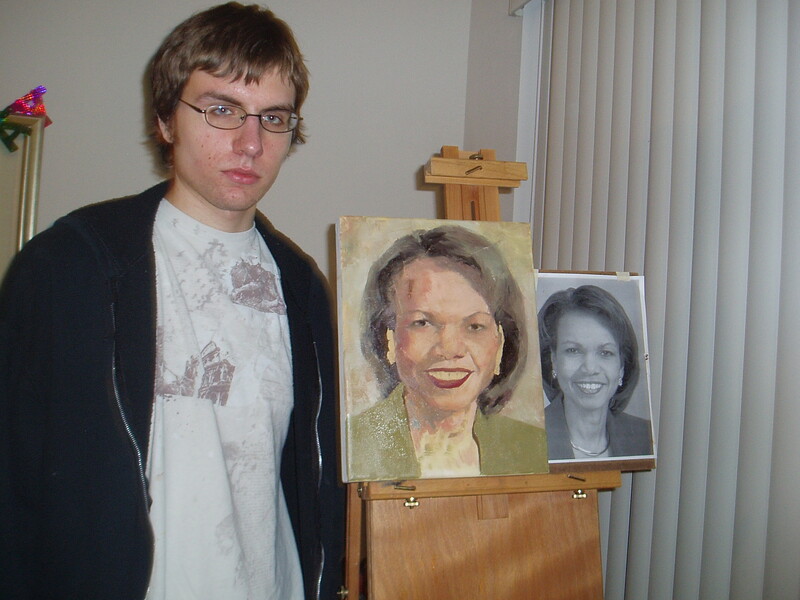 He was just commissioned to paint a portrait of former Secretary of State, Condoleezza Rice. Colin presented the portrait to Dr. Rice on Monday, February 8, at a press conference just before Dr. Rice spoke to a sold out crowd at the Van Wezel Performing Arts Center in Sarasota, FL. The town hall talk was sponsored by the Ringling College Library Association. Colin is a junior at Ringling College of Art & Design in Sarasota, FL just two hours from Disney World and one of the most prestigious art colleges in the nation. It was just ranked as the number one digital arts college in the world by Imagine, FX. The president of Ringling likes to boast that they have technology which rivals MIT. In fact, he states, the only organization in the state of Florida with more computing power is NASA. Through a special arrangement with Valencia Community College, Colin was able to complete his first year of college while finishing his senior year of high school. At the Valencia Student Art Show during his senior year of high school, Colin submitted three art pieces all of which won awards including Best in Show and two scholarships. He has worked as the Lead Photographer for Florida Dream Homes, the most trusted vacation rental home company right beside Disney World. In addition to taking photos of the vacation homes, he was the artistic designer for their website and helped to train the staff on all the artistic elements of the company. It has been a joy to watch Colin, who we also refer to as Number Two son, develop from a fledgling artist with a passion for drawing to a full fledged professional. His dedication and hard work are now being rewarded. What more can you say about an artist than to acknowledge that his first commission is to paint a portrait of the former Secretary of State? Wow, what an accomp-lishment! Congratulations, Colin. We are so proud of you. You can view a portfolio of Colin’s work at www.ColinBoyer.blogspot.com. The next several LanceAroundOrlando posts will focus on Colin’s portrait, his work at Ringling College and the town hall talk by Condoleezza Rice. Would You Kiss Sir Gus? The Montessori School of Celebration celebrated its 10 year anniversary at their annual International Festival in downtown Celebration on Saturday. The school was founded by a group of parents from the Celebration community. They selected Karen Simon and Helen DeVere of the Orlando Montessori Teacher Education Institute to own and run the school while the parents assisted in securing a building to house the school. After outgrowing the original two classroom school-house in the downtown business district, a larger school building was constructed in South Village right next to Heritage Hall and the community pool and ball fields. 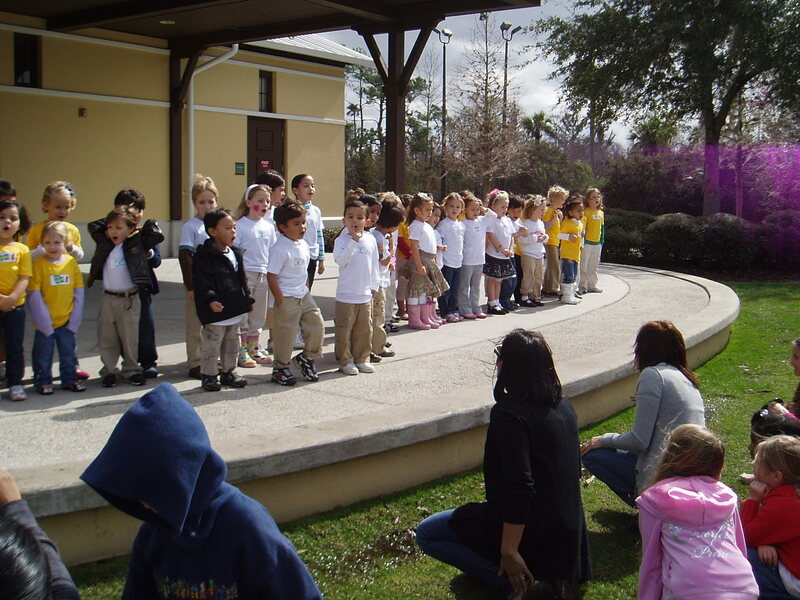 Over the past 10 years, many parents have testified to the incredible education their children receive at the Montessori School of Celebration. The school has expanded from its original two classrooms of two and a half to five year olds to its current structure that houses those classrooms plus a kindergarten, lower elementary, upper elementary and an adolescent and high school program. Through a special arrangement with Valencia Community College, qualified older students will be able to dual enroll at Valencia and receive college credit as they complete their high school education. 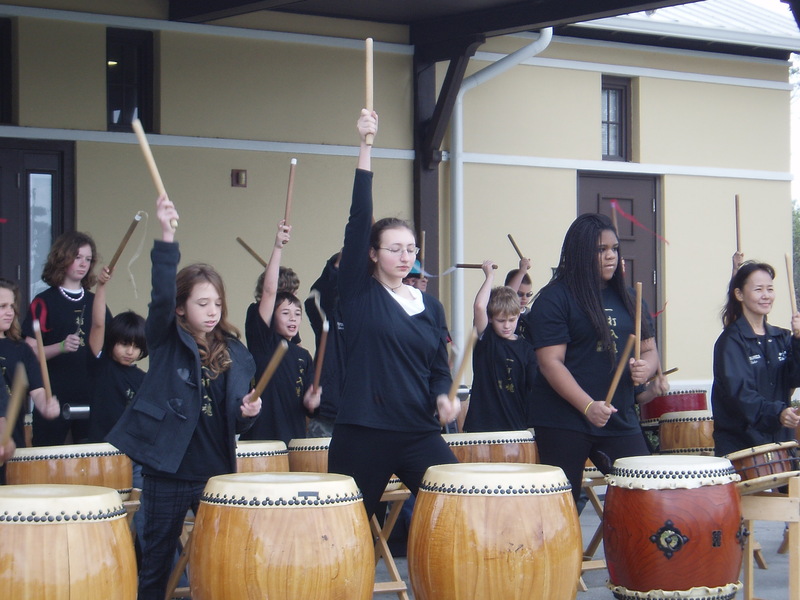 One of the highlights of the year is the school’s International Festival. Students spend several weeks researching a specific country and creating a booth filled with information, displays, artwork, activities and even foods to sample from the chosen country. This festival featured the countries of Sweden, Argentina, Canada, Morocco and The Netherlands. 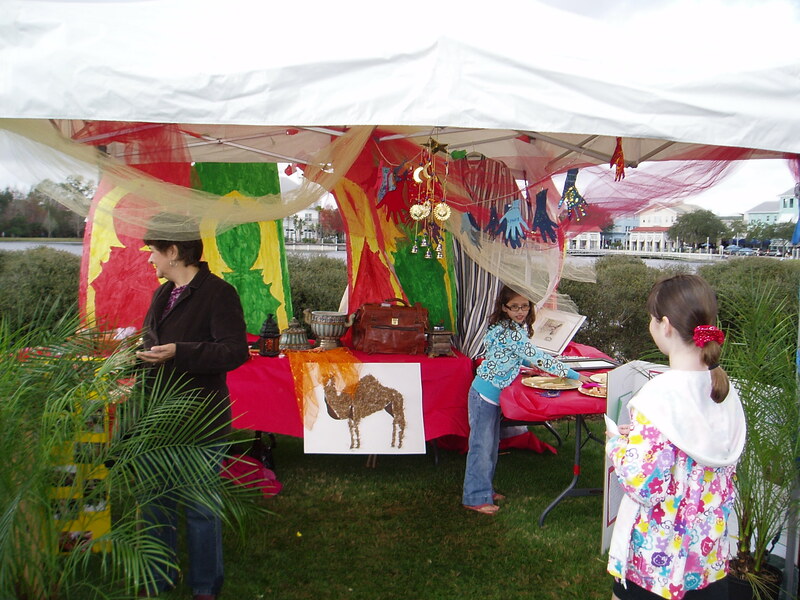 This year the children squealed with delight as the Moroccan booth featured a live camel. 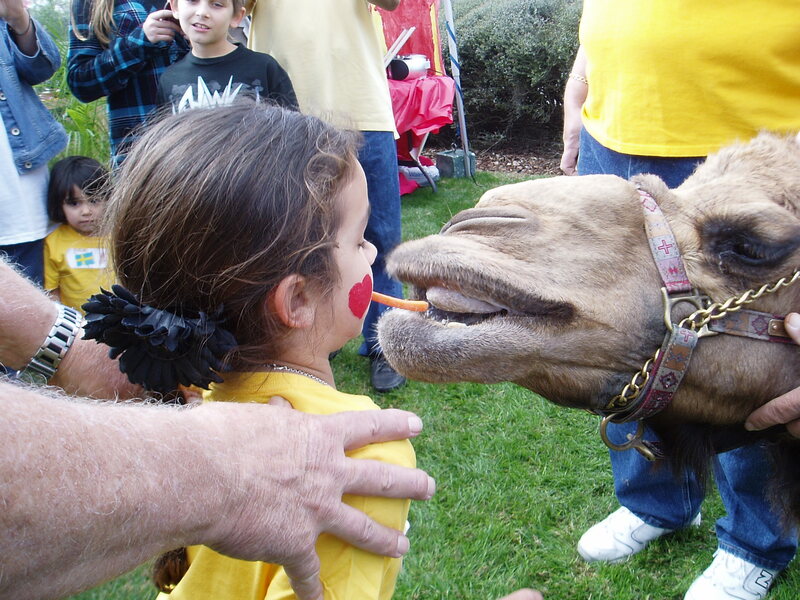 By placing a carrot in your mouth and then feeding it to the camel, you were given a sticker that read “I’ve been kissed by Sir Gus.” The camel was sponsored by the Bahia Shriners Orlando. During the festival, various school and community groups perform on stage. There is Taiko Drumming, gymnastics, singing and more. Between presentations, children get a passport and travel to the different country booths to get it stamped. There are also some bounce houses and food available. After the presentations, all the students of the school got together on stage, sang the school’s “gathering song” and then sang Happy Birthday to the school in honor of its 10th anniversary. There was not a dry eye among the founders of the school as the children sang. If you are in Celebration on Tuesday February 9th or Tuesday February 16th from 9:30am to 11:30am the Montessori School will be having an open house. The school will be in session and you can observe the students participating in the traditional Montessori educational environment. If you’ve never seen a Montessori classroom, I guarantee it will be something you will never forget. On Wednesday night Mrs. LanceAround and I went to our favorite arthouse movie theatre, the Enzian, to watch the 2003 movie “The House of Sand and Fog” (starring Ben Kingsley and Jennifer Connelly) and have a Q & A with the author of the novel on which the movie was based–Andre G. Dubus III. Andre appeared courtesy of the “Winter with the Writers” program at nearby Rollins College in Winter Park. This prestigious program, featuring some of the greatest writers of all time, is a tradition at Rollins College that dates back to 1927. Currently, the program features four unique and distinguished writers who come to the campus for a couple of days each winter to conduct a Masters class, do a reading and participate in other programs based on their work. Best of all, these sessions are free and open to the public! 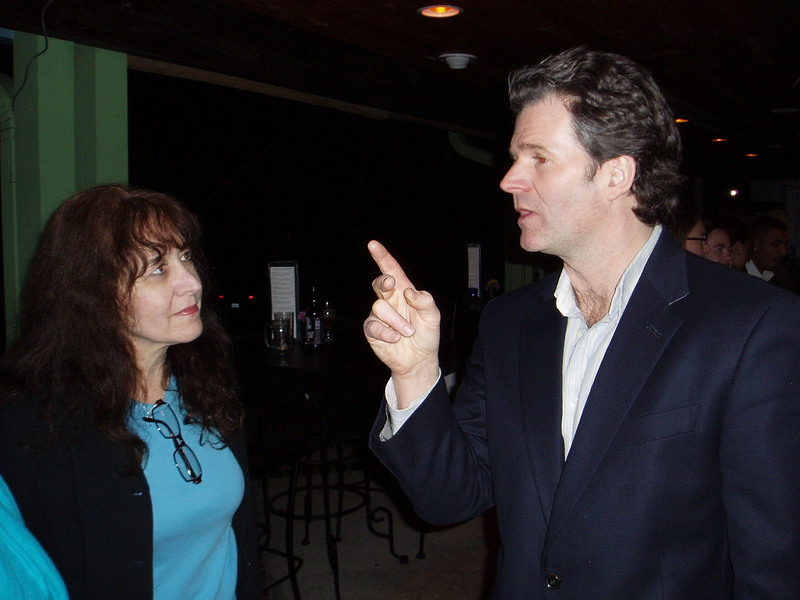 It was our luck that Andre Dubus III had a novel that was turned into a movie so we got to listen to a finalist for the National Book Award in 1999 while enjoying a delicious meal and fantastic movie at our favorite arthouse dinner theatre. At the end of the movie, Andre explained how the major Iranian character in his novel was based on the father of an Iranian woman he was courting while in college. One day, this woman’s father spoke with him in an elevator. He said that he remembered his country, Iran, before the Shah was removed from power. The father would routinely meet with presidents, kings and heads of state in his own, private office. Now, he had lost his position, his wealth and was working two separate eight hour shifts every day at two menial jobs just to survive. “I never saw this future for myself,” the Iranian father said. Those of you familiar with the movie or novel will instantly recognize this central character. Those of you unfamiliar with the story might want to buy the novel or see the movie. It is very touching. Be aware it is also very depressing. Andre told the story of how he received 140 calls from agents interested in turning his novel into a movie. Most of them, however, gave some rendition of, “It’s a very ‘adaptable’ story, Andre, and with a little tweaking will make a terrific movie.” When asked what they would tweak, they uniformly said that the story was depressing and would need a happier ending. Vadim Perelman was different. Even though he had never directed a movie, he told Andre that other directors would treat the movie like your baby tied to the radiator of a car and attached by a chain to another car. The baby would be torn and pulled to bits until it was unrecognizable. He told Andre he would make a movie true to his story and could only guarantee him that it would be relegated to arthouse theatres, would not make money and would not be seen by anyone. Andre sold the rights to him immediately. This is how the movie, “The House of Sand and Fog”, came to be. After the show, Mrs. LanceAround and I got to spend some time with Andre who regaled us with tales of writing his novels, playing as an extra in his movie, watching his story get adapted to the big screen and much more. I got Andre a beverage and listened as he answered all these questions and more from the curious crowd. Now the lucky readers of my blog will know about these obscure programs that are worth seeking out because they will provide experiences you’ll remember for a lifetime! On Monday 8 February, Condoleezza Rice will be speaking at Van Wezel Performing Arts Hall in Sarasota, FL. She will be giving a morning and evening talk. This talk is part of the Town Hall Lecture Series sponsored by the Ringling College Library Association. This association supports the Verman Kimbrough Memorial Library at Ringling College of Art & Design—One of the nation’s premier art & design colleges and ranked # 1 in the nation for digital design. Ringling College Library Association has commissioned local Kissimmee artist and current Ringling College Junior, Colin Boyer, to paint a portrait of Condoleezza Rice. This portrait will be presented to Dr. Rice at a press conference on the morning of February 8th. The portrait will then be displayed on the Van Wezel stage during Dr. Rice’s morning and evening talks that day. Colin Boyer is currently a Junior at Ringling College of Art & Design. He graduated from Celebration High School in 2008, after spending his senior year as a dual enrolled student at Valencia Community College. While at Valencia, Colin had three pieces accepted for the student art show. One of his pieces was selected as Best in Show. His other two pieces also won an award. In addition, he received two scholarships for his artwork in that show. When not in college, Colin lives with his parents, brother and sister in Kissimmee. His parents own a vacation rental home company and Colin is the Lead Photographer and Designer. Of course, regular readers of my blog may recognize Colin from other photos that identify him as Number Two Son!